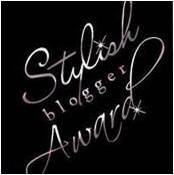 Today I received the Stylish Blogger Award again, this time from Brenda at "Creativity is Only a State of Mind." I've been dreadful about acknowledging with gratitude those who think highly enough of my blog to offer these awards. Thank you, Brenda! I realized just yesterday, when lugging into the garage a 50-pound bag of topsoil, how much better my bones/muscles would feel if I lost 50 pounds. The diet started today. Wish me luck!! When lugging in the same bag of topsoil, I realized I am no longer young. I am 55 and 2/3 today. Happy quasi-birthday to me. This calls for cake ... oh wait, there's a diet happening somewhere. And I also realized that one's back will hurt the day after lugging said bag of topsoil. It also is not comfy sitting at the computer keyboard for hours when one's back hurts. My bed is more comfortable for sleeping than my couch, especially when my back hurts. Napping is fun. One still needs to spread and seed said topsoil if fresh grass is to grow where there is none. I am the lone landscaper in my family. I'd rather be papercrafting than landscaping. On your rainy day, use the weather as your excuse to sit down, grab a cuppa Joe, and drink in the ideas from these and other paper crafters' blogs. Enjoy! Wow! Congratulations....well deserved. I too am the family gardener and feel your pain. Hope your back improves quickly. Love your sense of humor! I'm now a follower. And, I started the diet, or "new eating plan" myself via TOPS (Take Off Pounds Sensibly- like weight watchers but much less expensive at $4 per MONTH). It's going well. Hope you are successful!!! Wow! Thanks :) Still hard for me to believe total strangers are looking at (and enjoying) my projects! Ellen! You are so kind. Thank you for all of your positive comments on my blog and for this award! It was fun hopping with you over the weekend! Happy Day! Hi Ellen! Thank you so much for the award, It will be my honor to pay it forward! Love your blog! Stop over by my blog..I have something for you. On Monday's post.